For serial housesitters Denny and Eden Rudin, gone is their hectic, working-world life in the U.S., with car and mortgage payments and high medical costs. “With housesitting, we find it’s actually cheaper than our life was back in Arizona. Plus, we get to see new places,” they say. Back in Arizona, life was both sweet and fast-paced. Denny co-owned a stock car track, and Eden was the owner of a local ice-cream shop. So when the entrepreneurial couple decided to travel, it seemed natural that they would stumble upon housesitting. 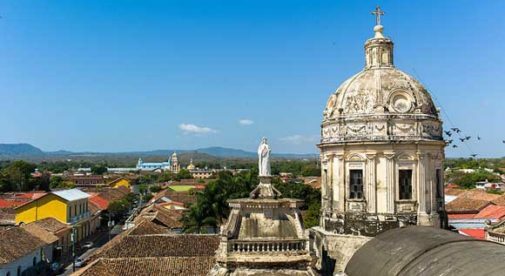 While looking at rental property in Granada, Nicaragua, they heard of another expat who needed a housesitter. They accepted the assignment and for the next year lived rent free throughout Nicaragua and Costa Rica. “Housesitting allows us to see places off the beaten path, by living in a real neighborhood,” says Eden. “Housesitting has taught me to appreciate the little things about a new location. Even exploring the local grocery stores is fascinating. “We estimate we’re saving $10,000 to $12,000 per year or more by not paying rent,” she says. Their monthly budget now is about $1,500, which includes travel to and from housesits. In 2014, Denny and Eden decided to retire to Belize; they had vacationed there some years before. But soon after settling into life there, they visited the colonial city of Granada. When they do get the urge for some retail therapy, they simply hop on a bus and within an hour are in Managua, Nicaragua’s capital. There they can find large shopping malls, movie theaters, and even massive members-only warehouse clubs. “And to think the bus ride costs us just a few bucks each,” says Eden. Eden spends her free time blogging, researching their next housesit, networking with other expats, and learning Spanish. She says, “We both eat better now and our stress levels are down.” She’s lost 15 pounds since selling the ice-cream business. Denny enjoys painting and writing, and has written a few fiction books that he now sells online. The Rudins plan to continue their nomadic, housesitting lifestyle until Denny is too old to get around (he’s 73) or it’s no longer fun. They are headed to Europe on an inexpensive repositioning cruise out of Panama that will leave them in Portugal. (“For around $350 each we can enjoy a mini-vacation on the ship that includes both food and unlimited alcohol.”) They have lined up housesits in Portugal, Spain, and Morocco that will take them into the fall.